I don’t know about you, but I find teaching children creative writing to be one of the most difficult, yet most rewarding, teaching tasks I do. For the first half of my teaching career I have to confess it was, on the whole, a hit and miss process. Mostly miss to begin with, then, gradually, more hit, as I slowly developed an understanding and appreciation of what it was I was trying to do. The six forms are such a simple, even basic, element of writing – indeed all art and art forms – that they should really be common knowledge in the same way primary colours are. I learnt about them on a course with Luke Abbott, along with a group of other teachers, and we immediately incorporated them into our classroom practice. I use them all the time when I’m teaching creative writing, with all ages of primary children, from Reception to Year 6. With the younger ones they can be used implicitly, through story-telling, drama, music, and art. By Year 2 (possibly Year 1) they can be taught explicitly so children can recognise them in writing and art, and start to incorporate them into their own work. I know teachers who put them up as a list on the wall, alongside other writing aids, and build them into their success criteria and marking feedback. 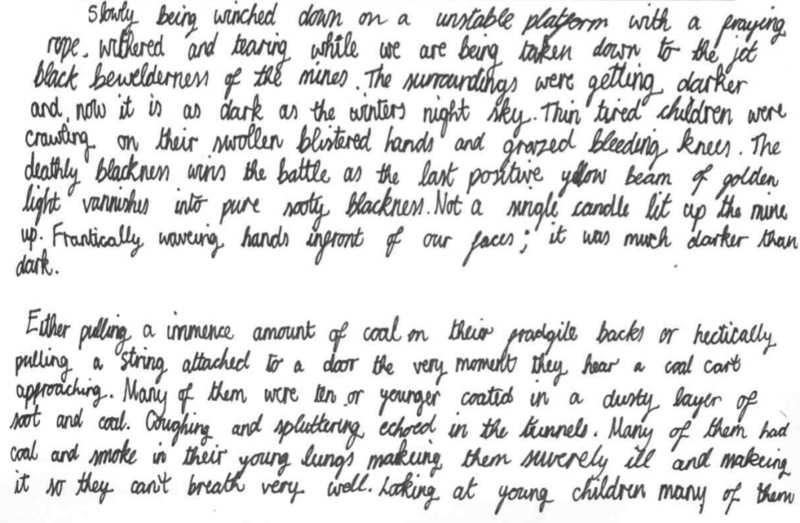 I’ve often used this opening extract from the Iron Man by Ted Hughes to introduce students to how the six forms work. I give them the extract, along with a marker pen, and ask them to underline every example they can find of each form – sound/silence; movement/stillness; darkness/light. I then read it out loud and ask them to put their hand up when they hear one. It doesn’t usually take long for them to get the idea. How far had he walked? Nobody knows. Where had he come from? Nobody knows. How was he made? Nobody knows. The wind sang through his iron fingers. His great iron head, shaped like a dustbin but as big as a bedroom, slowly turned to the right, slowly turned to the left. His iron ears turned, this way, that way. He was hearing the sea. His eyes, like headlamps, glowed white, then red, then infra-red, searching the sea. Never before had the Iron Man seen the sea. He swayed in the strong wind that pressed against his back. He swayed forward, on the brink of the high cliff. And his right foot, his enormous iron right foot, lifted – up, out, into space, and the Iron Man stepped forward, off the cliff into nothingness. Down the cliff the Iron Man came toppling, head over heels. His iron legs fell off. His iron arms broke off, and the hands broke off the arms. His great iron ears fell off and his eyes fell out. His great iron head fell off. All the separate pieces tumbled, scattered, crashing, bumping, clanging, down on to the rocky beach far below. A few rocks tumbled with him. Only the sound of the sea, chewing away at the edge of the rocky beach, where the bits and pieces of the Iron Man lay scattered far and wide, silent and unmoving. Only one of the iron hands, lying beside an old sand-logged washed-up seaman’s boot, waved its fingers for a minute, like a crab on its back. Then it lay still. While the stars went on wheeling through the sky and the wind went on tugging at the grass on the cliff-top and the sea went on boiling and booming. I also like to use paintings for the same purpose. This is one I’ve used with Year 2. I ask the students to look at the picture and see what they notice (I want them to look carefully, not to interpret). I’ll point out the life-boat if they miss it. 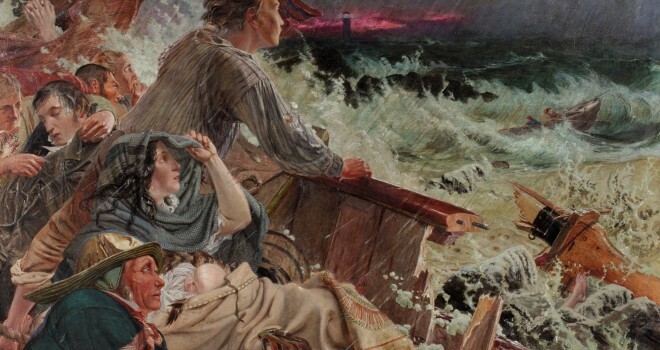 I ask them to imagine the sounds in the picture and to put them into a sentence with the following opening: “As the ship sank I could hear…” I write down their contributions. I ask them to imagine the movement in the picture and do the same. And the light. (For this picture, sound, movement, and light are the easiest of the six forms). I then ask them to do the same for silence, stillness, and darkness. If they struggle I model it for them myself. As we work in this way, over time, the students’ use of the six forms becomes more elaborate and sophisticated, and I ask them to start using them explicitly in their writing. We have found, as the children’s skills and understanding of writing improve, they begin to use the six forms as an integrated part of their writing. In the same way they use other elements of writing, grammar, metaphor etc. 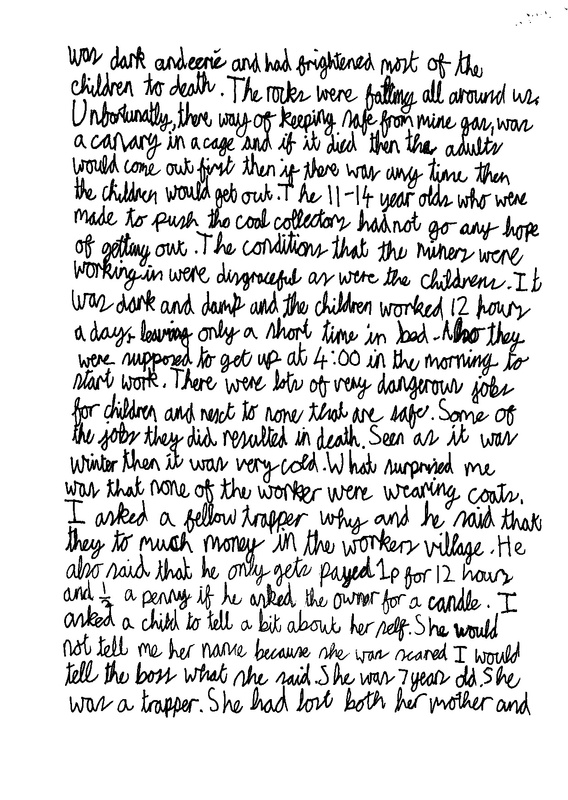 Here are some examples from a class of Years 5 & 6, writing a report to Parliament, as a team of mine inspectors in 1842. 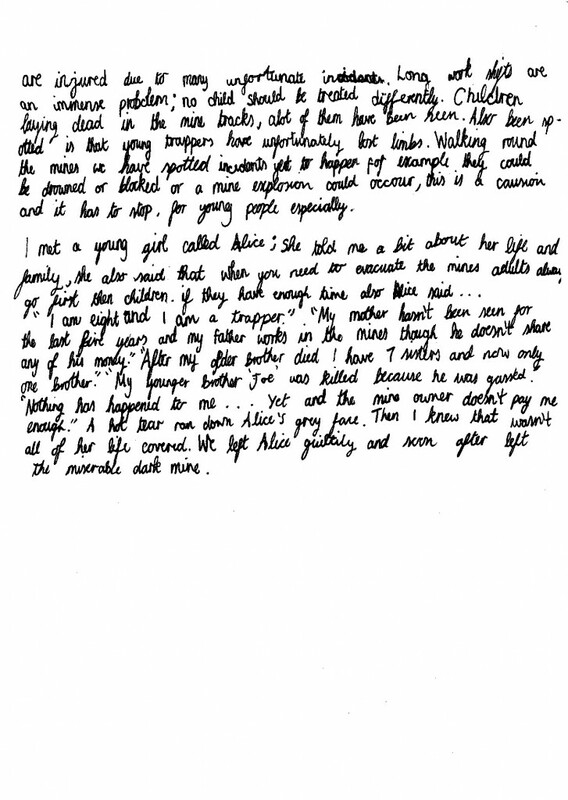 (Note 2: sorry for the quality of the reproduction of the students’ writing this was the best quality I could get using WordPress). Thank You! I use elements of these all the time in Art and Music but it had never occurred to bring them to creative writing too! Your class’s writing really shows the benefit of these ideas. 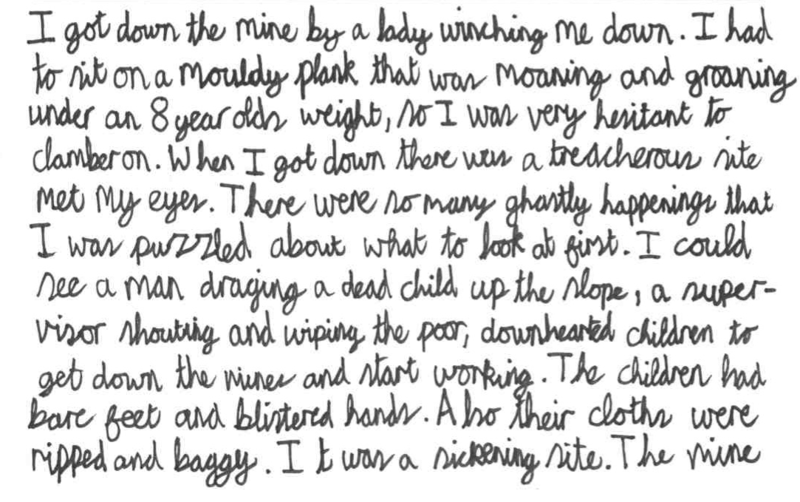 I love – ‘It was much darker than dark’. I will be nicking these ideas immediately and scuttling back to my room to share them with my year 3/4 kids. Thank you again! Thanks Marie, I hope your students find them useful.